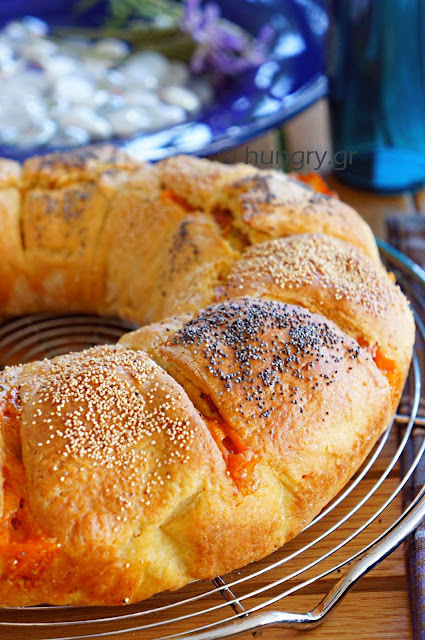 Salty bun, stuffed bread or oversized inflated bun; Whatever you call it remains a delicious, tasty treat. 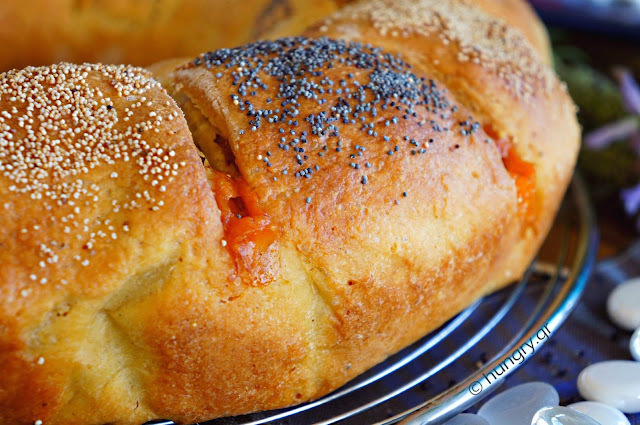 Enhanced bread dough as brioche, made without particular difficulty requirements. A little time to wait for inflation, like all yeast doughs, and thats it. Inflates perfect, kneaded and molded easily. The cheeses melt beautifully and with ham combined and diffuse into the crumb, giving it full of dense texture and flavor. 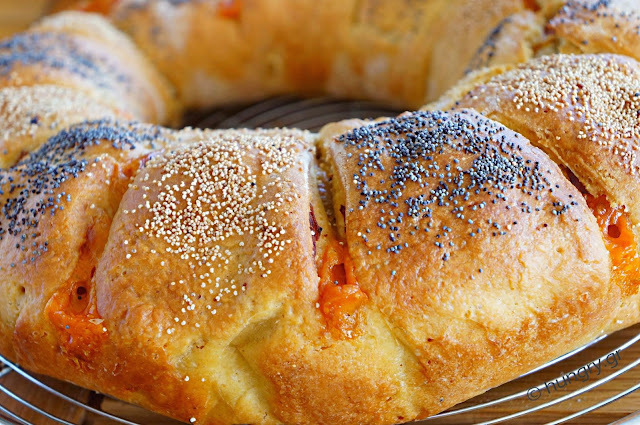 Poppy seeds give crunchy texture and make more interesting taste and sight. 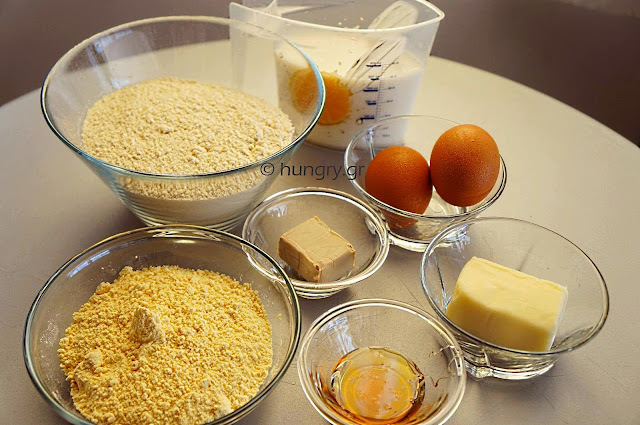 In a large bowl add some lukewarm milk (from the measured), honey, 2 tablespoons flour and yeast crumbled. Mix with a fork. Cover the bowl and leave aside for 15 minutes to foam the mixture. In a saucepan, gently heat the milk and put it into the butter to melt. 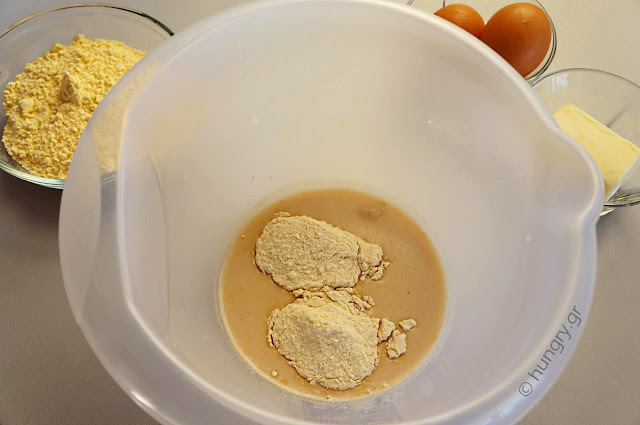 If it overheats let it become lukewarm and add to the bowl with the bloated yeast. 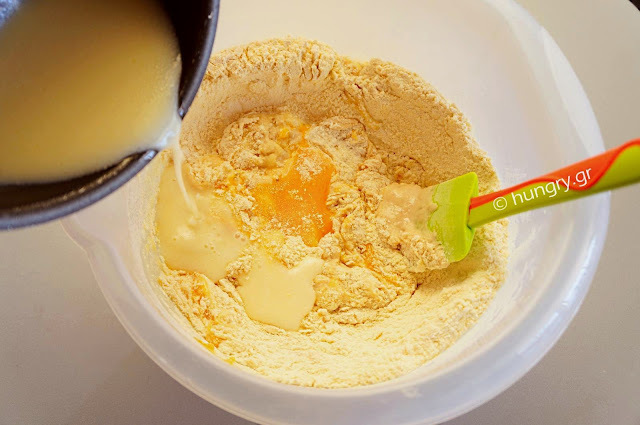 Add the remaining flour and eggs and knead vigorously until the mixture is smooth. Cover it and leave it in a warm place for 1 hour. 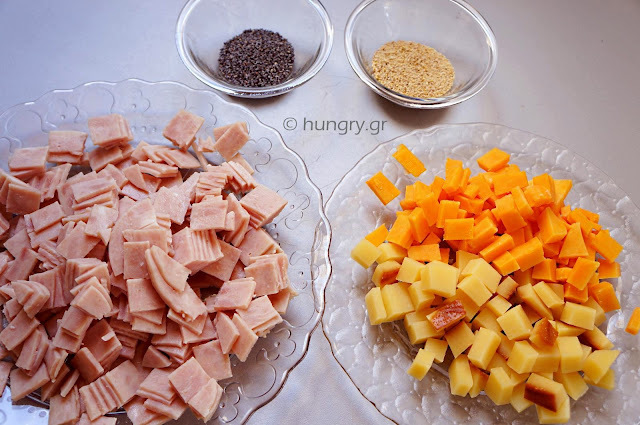 Chop into small squares the slices of ham and dice both the cheese. Put aside for a while, for when you need them. 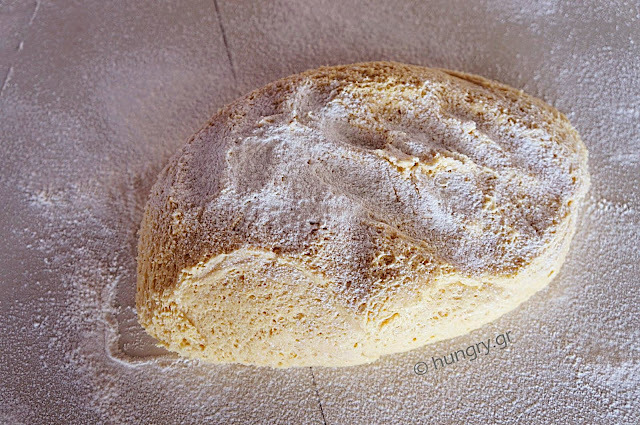 When the dough rise, empty the bowl onto a floured surface. 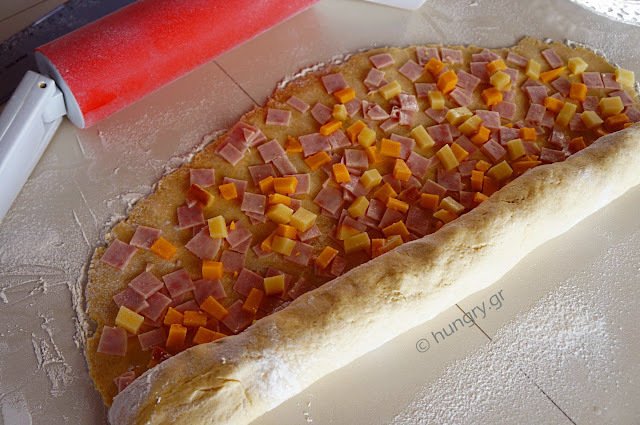 Knead lightly and roll, using a little flour, in an oblong / rectangular sheet ~50×30cm (~1.64×11.8 in), the thinner you can. 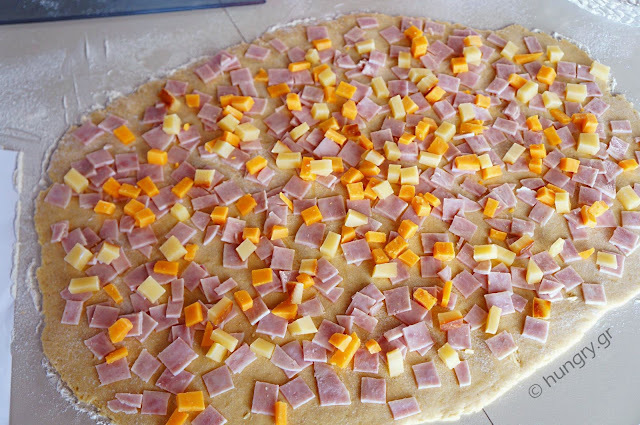 Sprinkle on the entire surface of the sheet shredded cheese and chopped ham. Lift up the long side that lies ahead and begin to wrap roll not too tight, so as to close the filling during winding. We roll up the other end. We invest with greaseproof paper a griddle round Ø32-34cm (Ø1 ft). 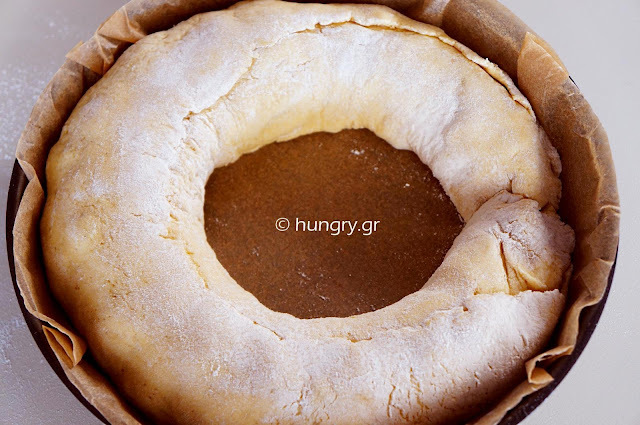 Carefully lift up the roll and place it in the pan, giving the circular form. Joining and push stick well the two ends of the circle and form a giant bun. Scratch the surface of the bun per 3-4cm (1.2-1.6 in), with a sharp blade in depth without to dislodge the pieces. 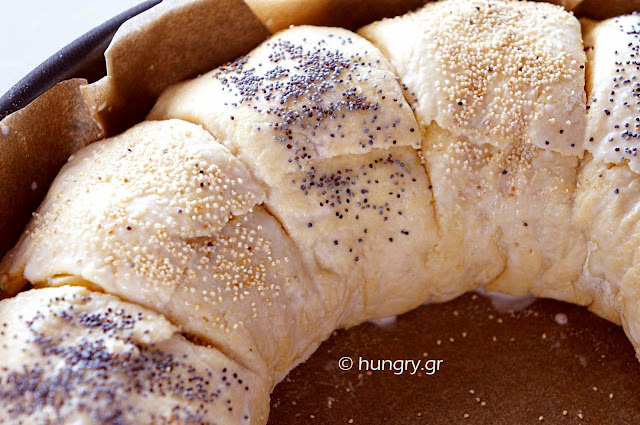 Brush with warm milk and sprinkle with poppy seeds. Cover and leave in a warm place to re-inflate for 1 hour. Bake at 180°C (356°F, Gas:4.2) for 30'-35' or until risen, cooked and golden brown. Fluffy, buttery and very tasty. A fluffy bread, cut in sticks. Bread sticks, flavored with garlic and basil, very easy to make and without much work. Enjoy them warm to accompany your appetizers and/or main dish. Try kneading today. It relieves stress! Golden, "cheesy" sliced bread, tasty and delicious. 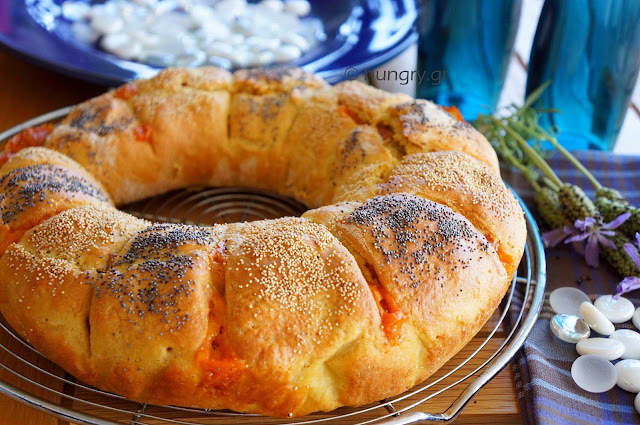 Sprinkled with cheese and garlic for an excellent taste. 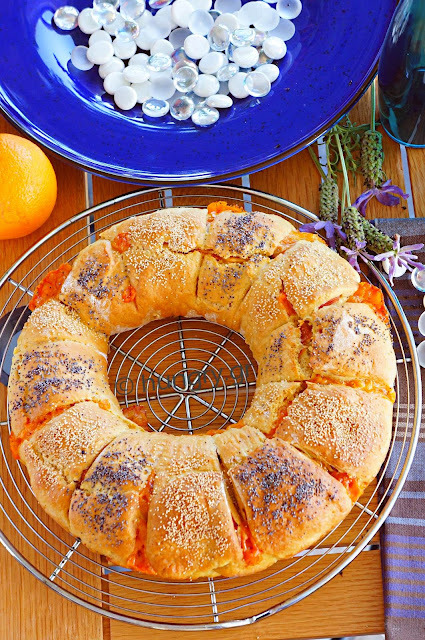 Make a quick, hearty, easy, and delicious appetizer that will accompany the drinks or food you intend to offer to friends and relatives or in an unannounced, sudden visit. 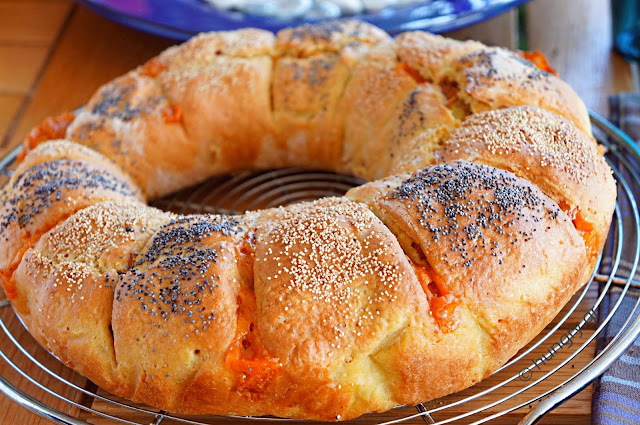 If you have your home made bread, then surely the taste will be better. Who does not prefer the easy and fast to prepare food, especially those who are employees, students but novices in the kitchen or just in a hurry. Tasty and bicolor -sesame & poppy seeds- pastry sticks, which in addition to enjoying them, may be combined with a multitude of accompaniments and spice, with their presence, even more what we want to accompany. From the simplest combination, like cheese and tomato until multi tasty dips or sauces and of course at the center of a buffet with finger food.